Trump also pivoted toward 2020 in his State of the Union address on Tuesday, laying out his clearest thematic blueprint yet for his re-election bid. The President proclaimed that an economic “miracle” was underway and mixed scalding rhetoric on immigration with claims that Democrats are marching left toward socialism. The most serious potential development for Trump came with the expansion of the House Intelligence Committee investigation beyond Russia, which likely means special counsel Robert Mueller’s report will not end the President’s political exposure. House Intelligence Chairman Adam Schiff announced that he would also look at whether any business ties between Trump and Saudi Arabia or any other nation were creating leverage over the administration’s foreign policy. It quickly became clear during the week that the commander in chief, who experienced only the most cursory oversight when Republicans ran both sides of Capitol Hill, is not enjoying his first taste of the new Democratic–led House. “No, we want to damage the President. We want to talk about your private conversations,” Collins said, paraphrasing what he said was the Democratic strategy. “I’m thinking about maybe we should just set up a popcorn machine in the back, because that’s what this is becoming. It’s becoming a show,” Collins said. But reflecting the deep animosity between the Democratic-led House and the executive branch, he threatened to haul Whitaker back to the committee for a closed-door deposition — even though Whitaker is likely to be out of a job within days, with William Barr expected to be confirmed as attorney general next week. 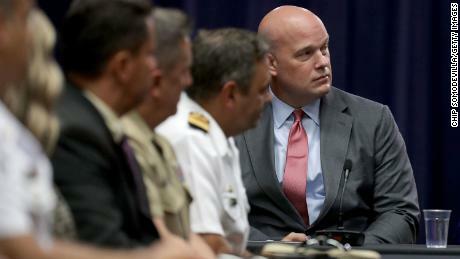 The acting attorney general’s performance appeared to exemplify an apparent contempt for oversight in the executive branch. Whitaker often looked like he was performing for a President who checks up on his appointees on television, rather than seriously trying to answer questions. At one point, in an intervention by a witness rarely seen before, he reminded Nadler that his time for questions had expired — risking the ire of the all-powerful chairman, who laughed off the impertinence. Despite prompting from Democrats on the panel, Whitaker refused to say the Mueller probe is not a “witch hunt” — Trump’s favorite phrase — though he insisted he had not interfered with the special counsel. In another front of the House Democrats’ investigations on Trump, another committee started the process of trying to force the President to reveal his tax returns, after he defied tradition in the 2016 campaign by refusing to do so. “We have to do the right thing. We are called to do the right thing, we have been selected, we have been chosen,” Lewis said. Democratic Rep. Tom Suozzi of New York told CNN’s Erica Hill that Democrats had to walk “a very delicate line” between genuine congressional oversight and over-exuberance. “You’re on a nice edge of balance,” said Suozzi. Outside the capital, Democratic activists are looking ahead to what they hope is a different future, as their party’s prospective presidential nominees conduct the most intense campaigning this weekend of their nascent race to date. His State of the Union address was a response to a political moment when he is under siege on many fronts — not least of them a duel over his border wall and government funding ahead of a deadline next Friday. “No issue better illustrates the divide between America’s working class and political class than illegal immigration,” Trump said in an appeal to his blue-collar voters in the South and industrial Midwest. The President’s attack on Democrats for embracing “socialism” was a sign that the GOP will seize on government programs on climate change, higher education and health care, advocated by rising stars like Rep. Alexandria Ocasio-Cortez of New York, to try to scare swing state voters. He was referring to a new law that eases restrictions on late-term abortions if the woman’s life or health is at risk.